Two minutes to tell a story on film. And a top prize of S$15,000 cash. 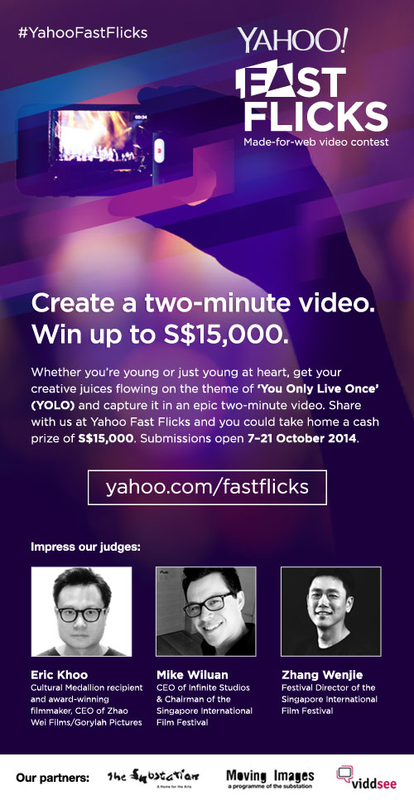 This is Yahoo Singapore’s inaugural made-for-web video competition. Called Yahoo Fast Flicks, all you need to do is make a video with the theme - YOLO. Any style, any genre! YOLO, in non-millenial speak, is You Only Live Once. Submissions will be accepted from October 7-21, and the best 30 entries will be handpicked and showcased across the Yahoo Singapore network and social media. The final top 10 entries and their teams will be invited to the grand finale on November 14, when they will battle it out for the top spot by making a final pitch to our esteemed judging panel: award-winning filmmaker and chief executive officer of Zhao Wei Films and Gorylah Pictures Eric Khoo, Singapore International Film Festival (SGIFF) director Zhang Wenjie, and CEO of Infinite Studios and SGIFF Chairman Mike Wiluan. First prize winners will take home a cash prize of S$15,000, first runner-up will receive S$5,000, while second runner-up will receive S$3,000. 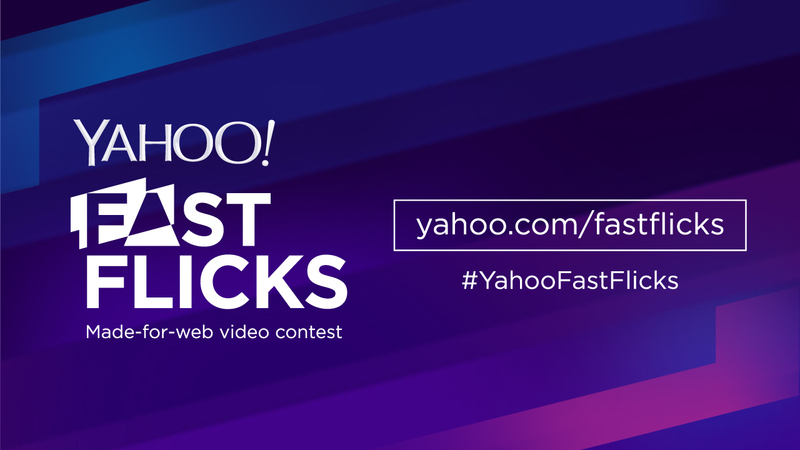 There will also be a special Yahoo Fast Flicks Fan Pick award, where the winner will take home S$2,000. Each winner will also receive one ticket to attend SGIFF’s Opening Gala, Silver Screen Awards, and Closing Gala held in December. The contest is open to all Singaporeans (including Singaporeans living overseas), permanent residents, and foreigners working or studying in Singapore. There is no age limit for this contest, however, if you are below 18 years of age, we will need written consent from your parent or legal guardian. (a) Formats: flv, mp4, avi, mpg, wmv, mov. (b) Maximum file size is approximately 2GB. (c) Video duration: minimum of one minute, maximum of two minutes. (d) Video must be in English or subtitled in English. (e) All submissions must include a three second end slate which is excluded from the two minute cap. Here's a list of FAQ. Full contest terms and conditions here. For more information, email us at ask-yff@yahoo-inc.com.